One of my favorite times of the year is spring. I love when daffodil bloom, azaleas and rhododendron, witch hazel and viburnum show their beautiful flowers. This is the first year the bleeding heart have bloomed. Such a delicate flower, acquired from a neighbor, one who dressed her daughters in my daughters hand me downs. Such a lovely connection..our daughters, now all grown, all taller than I am, who as they grew from toddlers to young women ran around/biked around/attended school and sports in outfits familiar to me. And now these beautiful flowers, on these sunny and cool spring days, remind me of those times. 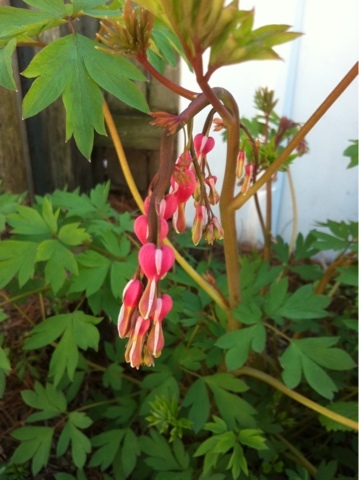 It might be that my neighbor got these bleeding hearts from me, and me back from her..sometimes things work like that.